We now know that planets are relatively common in the galaxy. So common that most Sun-like stars (using that term loosely) likely have planets. We also know that young stars commonly form with protoplanetary disks. We have observed clumps within these disks that indicate planets are forming. So we have a good handle on how planets form, and that this process is fairly common. There are, however, a few fuzzy patches in our understanding of planetary formation. One of these small mysteries concerns the earliest stages of clumping within the protoplanetary disk. A protoplanetary disk is a mixture of gas and dust. 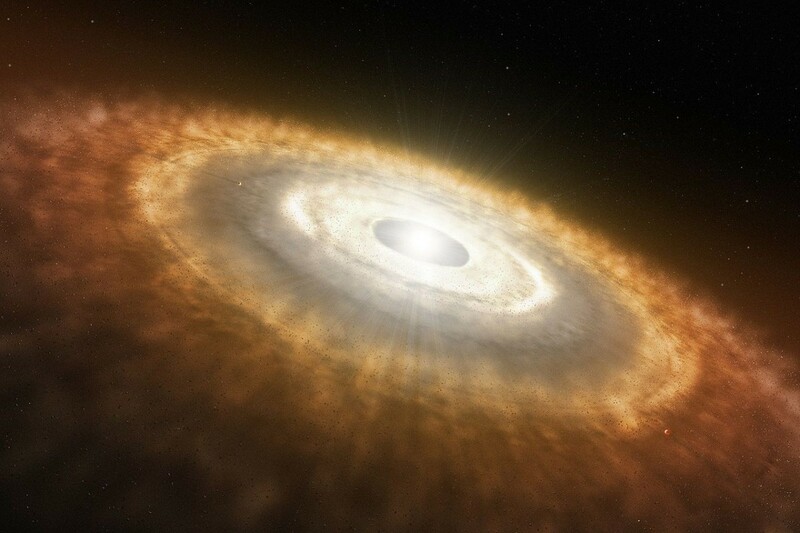 To form rocky, Earth-like planets, the dust must form a major part of a planet’s formation. The initial clumping must occur early on, which means it must happen while there is still plenty of gas in the disk, and this poses a bit of a mystery. Initially most of the dust grains are extremely tiny, less than a micrometer in size. Because they are so tiny, the amount of drag they experience from the surrounding gas is minimal. They are so tiny that they are almost gas-like in their behavior. For large clumps, on the order of hundreds of meters in diameter, the drag of surrounding gases is also relatively negligible. Their mass is large enough that over the 10 million year period of planetary formation, the gas doesn’t slow them down much. But in between there is a size that is big enough for drag to matter, but not massive enough to overcome that drag. This is on the scale of about a meter. When clumps reach this size, the drag of the surrounding gas would cause them to slow down rather quickly. As a result they would spiral into the star before they can grow much larger. This raised a bit of a mystery. As the micron-sized dust clumped larger and larger, it should reach a critical size of about a meter, spiral into the star, and be a lost resource for planets. If planets were fairly rare, it might be argued that planetary seeds started as large rocks formed before the protoplanetary disk. But the fact that planets are common means they must be formed by the initial clumping of tiny dust grains. 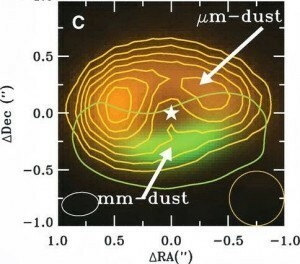 Distribution of dust around a star. Credit: Nienke van der Marel, et al. So what is going on? One proposed mechanism was that pressure waves would form within the gas of the disk early on. These pressure waves would act as a filter between smaller (sub-micron) dust grains and larger (micron-sized) dust grains. Since the drag on a dust grain increases with its size, the smaller grains could move more freely through the pressure wave, while the larger grains would be trapped by the pressure wave. This separation would reinforce the pressure wave, and provide a region where large (tens of meters) clumps could form without falling into the star. It seems like a reasonable idea, but finding evidence of this effect has been a bit of a challenge. Recently in Science, however, astronomers have found evidence of just such an effect. The team observed the star Oph IRS 48, which is a young star somewhat more massive than our sun with a protoplanetary disk. They observed the disk at submillimeter wavelengths, which is a spectrum range between infrared and microwave wavelengths. The advantage of submillimeter observations is that you can get a measure of the size of dust grains in the disk. This is because light of a particular wavelength will tend to be scattered by particles of a similar size. So by looking their emission at several frequencies in the submillimeter range, you can distinguish between micron-sized particles and millimeter sized ones. The result is seen in the figure above. As you can see, the micron-sized dust is distributed somewhat evenly around the star, while the millimeter grains are concentrated in a particular region. This is exactly the type of distribution you would expect in the pressure wave model. So it seems early planetary formation may be a trap after all. How about Van der Wall’s forces, slipstreaming, ionised particles repelling particles into each other, or even the Casimir effect?